L = 480 mm; typical bead L = 12, W = 11, th = 10 mm; diam cord = 1.5 mm [RTS 30/6/2004]. This object was entered under the name of Henry Balfour, but this may have been a convenience, and it is possible that the actual donor was Armine Charles Almroth Wright; see the RDF [RTS 13/5/2004]. Necklet consisting of two strands of grass fibres twisted together to form a cord, on which 91 wooden beads have been strung. The beads vary in length and diameter, but have been strung so that beads of approximately the same diameter are usually adjacent to one another, with the diameters decreasing towards either end. The beads are made of short lengths of a woody plant, with the original rough, irregular surface preserved; they have been cut flat at either end and pierced through the centre, but are only roughly cylindrical. The beads have a strong scent, similar to that of sandalwood, and may be from the cyperus plant which has a similar woody stem. There are traces of red ochre on the surface of most beads (Pantone 492C); the wood itself is a dark brown colour at the surface (Pantone black 7C), and a lighter yellowish colour beneath (Pantone 7507C). The fibre cord has been knotted at three points along its length, before being tied together at the top, leaving two dangling strands of 17 and 16 beads respectively, with a knot at the end of each strand to prevent the beads sliding off. The necklace is complete, but the cord is frayed in parts and has been partly mended with modern cotton thread. It weighs 65.4 grams, and has a length of 480 mm, as strung; the cord has a diameter of 1.5 mm; a typical bead is 12 mm long, 11 mm wide and 10 mm thick. The collector and donor of this item is not certain, but may have been Armine Charles Almroth Wright; it is thought to have come from the general area of the Upper Nile. 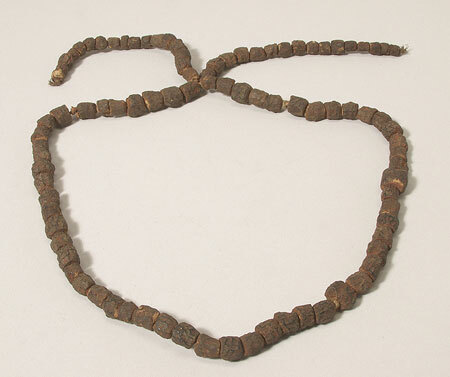 This object is similar to 1884.75.26, a scented wooden necklace of cyperus tubers collected by Petherick in the Sudan; Petherick does not state what cultures made use of this type of object. For other cyperus sp. necklaces, see 1884.75.27-28. Presumably these beads are made from the woody stem or culm of the plant. It is also similar to 1940.7.082, from the Imatong tribe. Additional Accession Book Entry - [p. 88, facing] *Similar specimen in the S.P. Powell coll., 1940.7.082. from the IMATONG, A.E. SUDAN. Card Catalogue Entry - There is no further information on the catalogue card [RTS 30/1/2004]. Related Documents File - It is possible the donor has been incorrectly identified as Henry Balfour. In the Related Documents File is a list detailing: "Donors, or probable donors, of material entered under Mr. Balfour's name. 1942.1.44-451, Belts etc. ?A. C. A. Wright" [MR 2/5/2000]. Old Pitt Rivers Museum label - Necklace with beads of scented wood. ?UPPER NILE [rectangular metal edged tag, tied to object, RTS 13/5/2004]. Sparks, Rachael. "Scented necklet" Southern Sudan Project (in development). 03 Jan. 2006. Pitt Rivers Museum. <http://southernsudan.prm.ox.ac.uk/details/1942.1.447/>.